Yonked :: Diary of a New Home: Toto, I have a feeling we are not in Yonkers anymore! Toto, I have a feeling we are not in Yonkers anymore! Others were not so lucky. The Tornado hit harder about 20 minutes north. 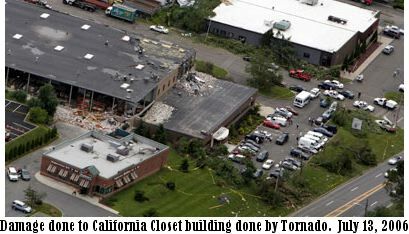 The California Closet store that we used for our closet was actually destroyed! A closet system was lifted out of there and deposited by the wind across the street. Many trees came down. The destruction was pretty amazing-- but somehow nobody was killed, Thank God! Although a state trooper's cruiser was lifted up in the air with him in it. You can also visit this website to see articles about the Tornado. Weirdly, this is not the first time a tornado has hit in New York. It seems that several of them in the last few years have been spotted, and in the 1970's, and a couple of major disasters in the 20's. Cyclical cyclones, I guess! Comments on "Toto, I have a feeling we are not in Yonkers anymore!"